Dollars and Sense combines systems thinking and mathematical tools with computer simulations in challenging students to manage their personal financial futures. 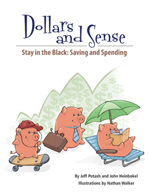 Lessons in Dollars and Sense: Stay in the Black: Saving and Spending, geared toward students as young as 10 (on up to adults! ), progress from simple lessons in saving toward goals, to saving and spending and finally to saving with interest. 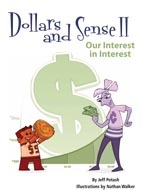 Dollars and Sense II: Our Interest in Interest adds greater realism, first by introducing how individual interest-bearing AND interest charging instruments (credit cards, mortgages, loans) work, then by challenging students to balance each in their efforts to maximize their chance for building a prosperous future. Both modules Dollars and Sense: Stay in the Black: Saving and Spending and Dollars and Sense II: Our Interest in Interest are available in book form or online as pdf lessons and simulations. Dollars and Sense II: Our Interest in Interest. The books include Instructor Guides and Student Worksheets. By encouraging students to explore a diverse set of financial situations, the Guides and Worksheets further support student learning in four different ways. Learn by doing (constructivism): asking open-ended “what if” questions and using meaningful real-world examples. Learn by building a conceptual foundation: connecting important mathematical skills and tools (tables, graphs) with a systems thinking conceptual framework. This framework visually represents dynamically changing financial “systems” (e.g., a personal savings account). Learn by challenging preconceptions: discovering, by using computer simulations, that there is more than one right “answer” or way to successfully manage one’s finances. Learn by sharing, comparing, collaborating, and applying the lessons to meaningful personal financial problems. Numerous mathematical and systems thinking standards are addressed by both books. Explore the standards covered by Stay in the Black or by Our Interest in Interest.